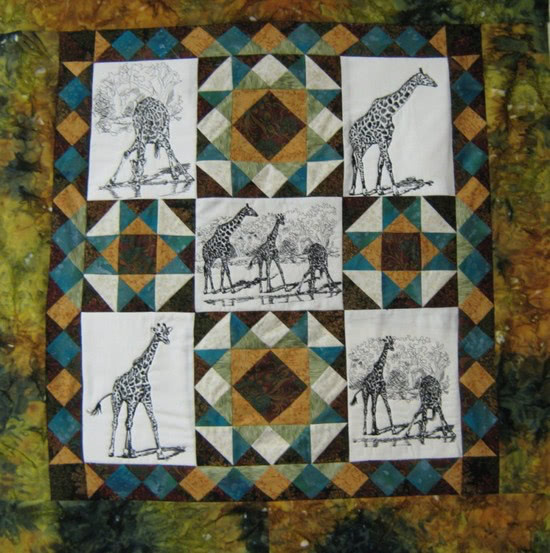 Please join me in welcoming today’s guest blogger Marié du Toit from South Africa as she shares her journey with machine embroidery and digitizing designs for quilts. The Best Of Show winner at the Denver National Quilt Festival Seven Dysfunctional Sisters by Pat Munroe & Gina Vickrey is a beautiful embroidered quilt. It is wonderful for me that digitized machine embroidery is present in the top quilts in the world. I have been quilting for 30 years and when I upgrade my machine in 2001, the top model of that time, the Artista 170 of Bernina also had an embroidery module included. After my first lesson in machine embroidery I thought it was too complicated and so the embroidery module was packed away. 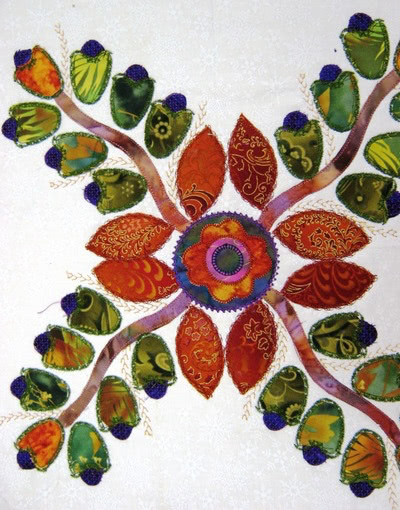 In 2007, Quilt University offered a digital embroidery course with Joanne Winn. If you did not have an embroidery module she would show you how to do the crazy patch using the machine’s built in stitches. So I had nothing to loose! She is a wonderful teacher and suddenly I was not scared of my embroidery module anymore. I tried my new learned knowledge on several projects. I made a sampler quilt from a Threads and Crafts Magazine (South Africa). To make it more unique I decided to sew out some of the designs I got with my software. I created bigger background areas by designing the sashing so that part of it was in the same fabric as the background blocks. The embroidery was done after the block was completed and the sashings attached. I called this integrated embroidery because the idea is that it should be part of the quilt and not separate embroideries as show pieces. My friend Susan Wessels asked me to convert her original Zanki designs in Art files and sew them out to make sure the conversion was correct. (She digitized with Janome software.) Embroidering every day really propelled me to become a real embroiderer. Susan’s designs are very artful and I was honored to work so closely with her designs. The next step for me was to learn to digitize myself. Our local Bernina dealer, Hanlie Snyman is a wealth of information and a very good teacher. I live on a farm about 60 km from her shop so when I found that I could further learn digitizing on the Internet at The School of Digitizing, I was so happy! It is good to have a project and do the digitizing around that. 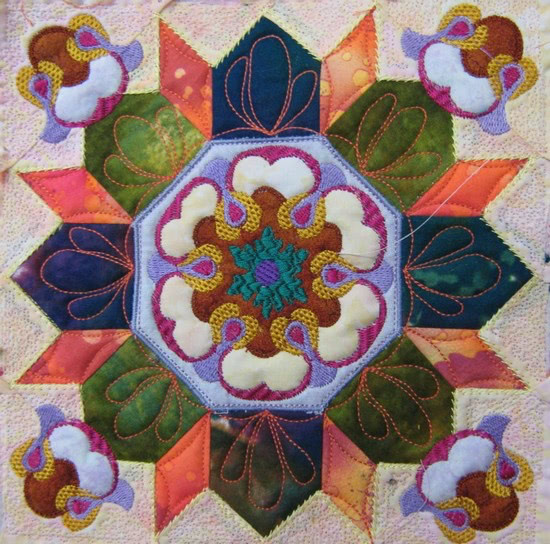 I followed the BOM in appliqué 2010 on The Quilt Show. I have digitized four of the blocks and sewed three. Appliqué is very easy to digitize but I try not to use satin stitch as appliqué method. For me the heavy satin stitches distract from the appliqué. I digitized a few of Aie Rossman’s heart appliqué blocks. I am actually making two quilts. I do the block on maroon fabric first and then correct any digitized faults and re-sew the block on dark green for a more "faultless" quilt. We went to Russia last year and I was so inspired by the beautiful artworks, tiles and wooden floors that I used these designs to digitize embroidery for a quilt I entered in the Benartex competition. This quilt will be exhibited at the 16th South African National Quilt Festival from 1-7 July in Stellenbosch. The block "Yaroslav" was first sewn out and then improved to be used in the quilt. It was inspired by a wall tile at a church in Yaroslav (Russia) – a town that celebrated its 1000th birthday in September last year. The blocks for my Russian inspiration were pieced in the embroidery hoop with digitized instructions. 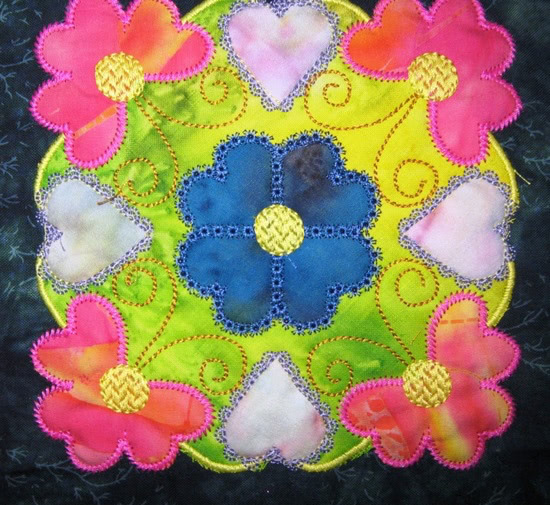 I combined the piecing with appliqué to make the block in one hooping. The embroidery is then sewn in the correct positions. I then add the backing fabric and the quilting (also digitized). The blocks were then sewn together and the seams at the back were covered with a binding. For me this was a real triumph – my first project planned and digitized from start to finish by me. I still make quilts without embroidery but I am also constantly thinking of how I can incorporate embroidery in my quilting. I discuss this, as well as quick piecing methods, my machine quilting efforts, my quilt life and life on a farm on my blog, Machine Embroidery by a Quilter. So what do you think? Is machine embroidery something that you would like to incorporate in your quilting? Please give your views on this subject. Then you can only use standard designs. I have an embroidery unit for my sewing machine and I used it a bit when I bought it, but it’s been sitting there for over a year now without being used. I keep thinking that I should incorporate it into the quilting work that I’m doing these days, but hadn’t thought beyond the idea of embroidering a square and inserting it into a block. 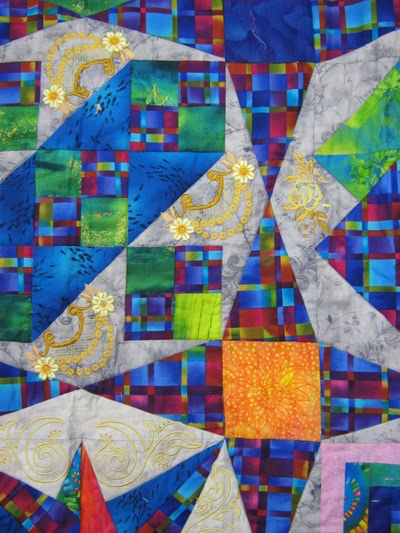 I love your idea of making the embroidery fall over into the sashing to make it blend the quilt together! Also I love the stitches you’ve used instead of satin stitch for the applique. The embroidery satin stitch is rather heavy. The floral stitches you have chosen add so much beauty to the block. WOW! Opens my mind to digitized art…I have been a free-motion snob so far! The stitch that mimics tatting blew me away! Incredible talent you have! These are fantastic. I have to admit, I like the giraffes.